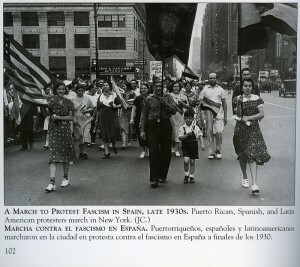 Photo from the Jesús Colón papers, reprinted in Virginia Sánchez Korrol's book on Puerto Rican immigrants in New York. Several years ago, when the Museum of the City of New York was gearing up for its show “Facing Fascism: New York and the Spanish Civil War,” we realized that while we knew a good deal about how some communities or groups in New York had responded to the outbreak of the war in Spain –African-Americans and Jews, in particular– we knew almost nothing about how the city’s significant and growing hispanic community had reacted to the Spanish conflagration. In my essay for the catalog of “Facing Fascism,” I attempted to begin to remedy this lacuna, by exploring the city’s Spanish-language press from the period. In hindsight, I do feel that I made some headway, though I also realize that in the essay I underestimate the importance of the small but active pro-Franco Hispanic lobby in the city. One promising insight which I wasn’t able to fully flesh out in that essay is that the Spanish Civil War actually served to galvanize a wide spectrum of Spanish-speaking groups and organizations, providing a common political and humanitarian cause for progressive, working class immigrants from Spain, Puerto Rico, Cuba and other parts of the Spanish-speaking world. I was very gratified to see how the curators of the recent mega-show “Nueva York: 1613 -1945″ (New York Historical Society, Museo del Barrio, Oct 2010 – Jan 2011) actually used and further developed this insight about the galvanizing force of Spanish Civil War among the city’s Spanish-speakers; photographs and paintings of the city’s latino reaction to the war in Spain marked the provisional end-point of the show’s vast narrative arc, from Nieuw Amsterdam to Nueva Yor. Stay tuned.